A special election is being held in Florida’s 13th Congressional District to elect a representative to fill the late Republican Bill Young’s Congressional seat. The election will be held on March 11th, 2014. Libertarian Lucas Overby won the Bay News 9 Post Debate Poll with 45%. 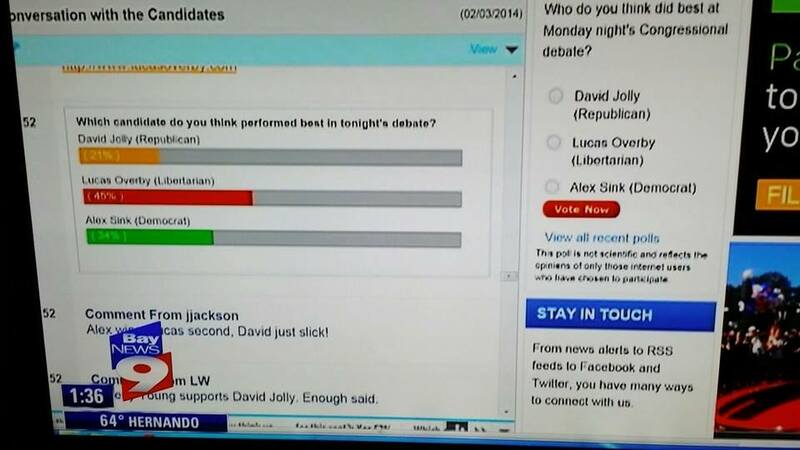 On Monday, February 3rd, 2014, Libertarian Congressional Candidate Lucas Overby won the 13th Congressional District (of Pinellas County, Florida) Debate with 45% in a post debate poll conducted by Bay News 9 (the network that hosted the debate). One of the interesting things about this debate is that Lucas made history, becoming the first Libertarian candidate to participate in a nationally televised debate. The debate was hosted by Bay News 9 and picked up by C-Span (it aired on C-Span 3). Viewers all around the world were able to watch Lucas take on his Democratic and Republican opponents – and WIN! For the first part of the debate, the Democratic and Republican candidates tried to ignore Lucas, referring to “my opponent” in their answers as if there were only two candidates in the race. Bay News 9 debate hosts quickly brought Lucas into the conversation and it was clear at that point that he had a firm grasp of what his constituents in Pinellas County wanted to see in the candidate they will be electing in March. His answers were clear and concise. He was the only debate participant that followed the rules set forth by the debate moderators. 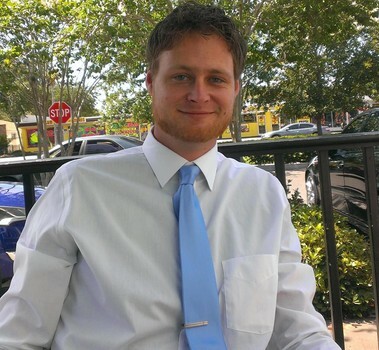 Libertarian Congressional Candidate Lucas Overby, who is running for Congress in Florida’s 13th District. Lucas’ opponents were not the only ones trying to ignore him. Journalists across the board, who wrote about the debate tried desperately to hide the Libertarian’s views from the public. Some articles barely gave his name a mention, while others mentioned his name a couple of times at best. None of them provided ANY of his answers to the various questions asked at the debate. You can view some of these articles here and here. Even C-Span refused to put his name up on the screen when they would come back from the commercial breaks. Lucas was undeterred and maintained a professional attitude for the entire debate. The most interesting part of the debate came when each candidate was allowed to ask another candidate a question. Alex Sink (D) quizzed Lucas on the Libertarian Party platform and this gave him a chance to explain the platform to viewers who may not be familiar with it. David Jolly (R) directed his question to Sink, further bringing his claims that she is a carpetbagger, into the public eye. However, the best question of all came from Lucas, when he asked Sink to explain the difference between “entitlements” and “welfare.” After a long pause, and much stumbling over her own words, Sink gave an answer that clearly showed she had no idea what she was talking about. Both the Republican and Democratic Candidates in the race were promoting the same, stale, ideas that have landed this country in it’s current economic mess. The clear choice for Pinellas County is Lucas Overby. He is a life long resident of the county (his opponents are not), and he has been travelling his district for a year, talking with voters and engaging them. You can view the entire hour-long debate here. You can also visit Lucas Overby’s Facebook page here or his web site here. 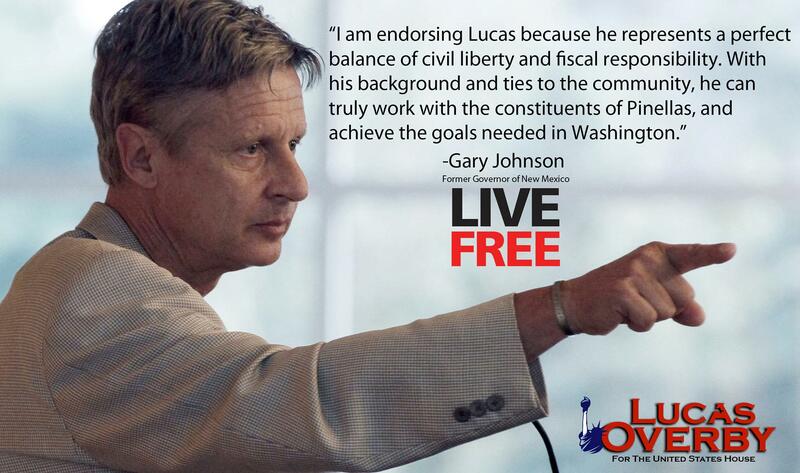 2012 Libertarian Presidential Candidate Gary Johnson Endorses Lucas Overby. Lucas needs your support to win on March 11th. You may donate to the campaign here. You can sign up to volunteer via the web site. The Question Libertarians Just Can’t Answer – Answered! Stefan Molyneux answers the question that Libertarians just can’t answer. And what a job he does! You’ll enjoy learning about the Libertarian Philosophy as explained by Stefan. Hello there and welcome to my new blog. My name is Joe Enroughty and I am a Libertarian Activist in the state of Virginia. I am a member of the Libertarian Party Of Virginia and the National Libertarian Party. From time to time I will be discussing Libertarian politics inside and outside of Virginia. I will be focusing my attention on quality Libertarian candidates who are running for various offices inside and outside the state of Virginia. In a broader sense, I will also be discussing any pressing issues that may arise that pertain to the Libertarian Party itself, such as newly elected officers, new chapters that arise around the state, and really just anything I find might be important. While I applaud Ron Paul’s effort to try and conquer the Republican Party from within (which doesn’t really seem to be working), I feel that our best hope for freedom and Liberty lies within the Libertarian Party. We are making great strides and have come so far in the last few years. It can only get better. I hope you’ll stick with me on my political journey and perhaps even provide your own thoughts and opinions throughout the process. Here’s to Liberty in Virginia…and beyond!